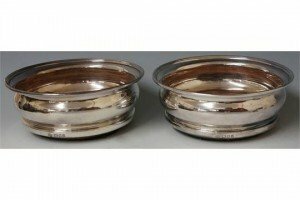 A pair of Georgian style wine coasters with ogee moulded bodies, draught turned wooden bases. 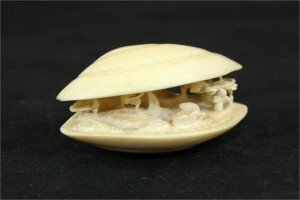 An early 20th century Japanese clam shell form netsuke carved with an interior agricultural scene. 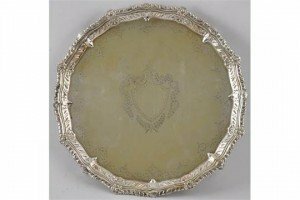 An early 20th Century Sheffield plate engraved card tray with embossed gadrooned rim. 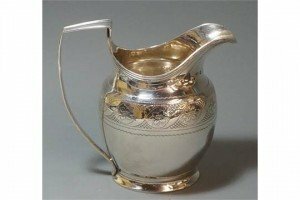 A George III silver milk jug, line and bead decoration near upper and lower rims, band of floral and quilted design detailing to body. 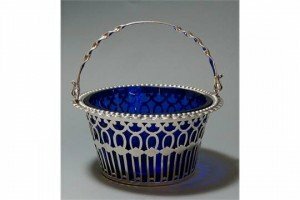 An Edwardian silver sugar bowl, pierced fretwork body, ruffled and beaded upper rim, twist handle, blue glass liner. 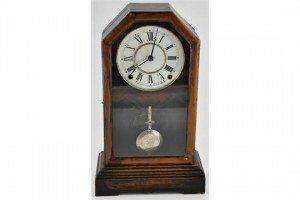 An early 20th Century American glazed mahogany cased mantle clock, the circular white enamel dial marked with Roman Numerals. 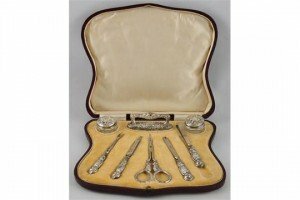 A cased 8 piece Edwardian silver mounted steel manicure set. Birmingham 1908. 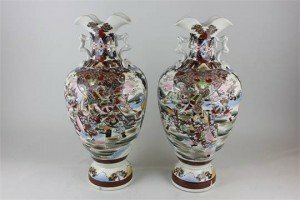 A pair of Japanese Satsuma baluster vases depicting warriors in battle, character marks to base. 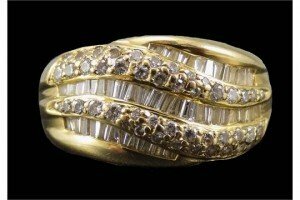 A 14 carat gold cut diamond channel set cluster ring, comprises three rows of Baguette cut diamonds and two rows of brilliant cut diamonds. Estimate diamond weight 1.5 carats. 8.2 grams. 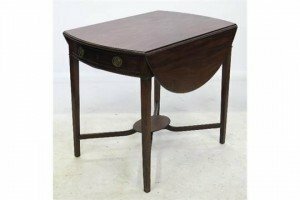 A 19th century mahogany D-shaped folding tea table, with box line edging, raised on four square tapering legs. 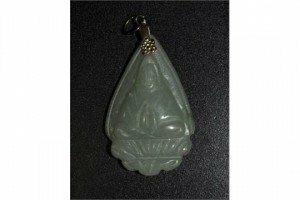 A Chinese carved Jade buddah pendant, set in an unmarked yellow metal mount. 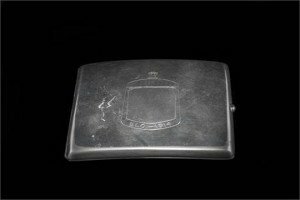 An early 20th Century silver cigarette case of curved rectangular form. 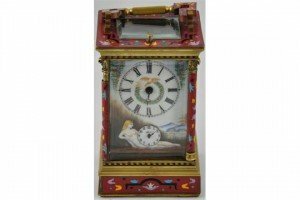 The front engraved with a car radiator grill, with a cabochon cut Sapphire. 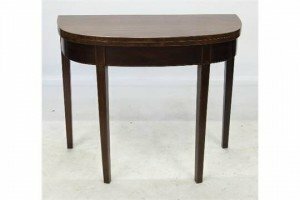 A Georgian mahogany oval Pembroke table, fitted with a frieze drawer, raised on square tapering legs united by cross stretchers. 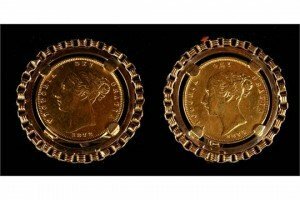 A pair of 9 carat gold cuff links set with two Victorian shield back half-sovereigns 1875. 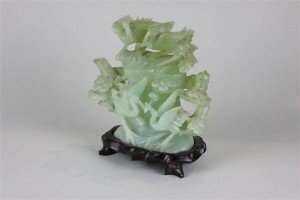 A Chinese green jade coloured glass carved ornamental teapot, decorated with storks amongst foliage, raised on a hardwood base. 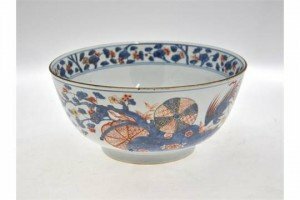 A Chinese early 18th century Imari bowl decorated with fabulous birds amidst prunus. 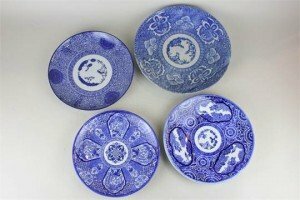 Four various Chinese blue and white plates decorated with phoenix, dragons and cherry blossom. 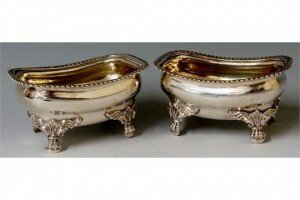 A pair of George IV salts of rounded rectangular design, the ogee bodies with gadrooned rims on four leaf cast paw feet. 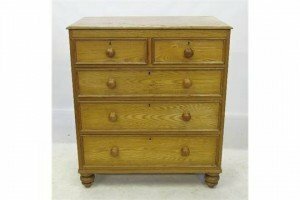 A 19th century oak and pine chest of drawers, fitted two short drawers over three long drawers, raised on turned feet.